Crypto Faucets Are a Waste of Time - Except This One, if You Have Referrals! Everybody who has been part of the cryptocurrency space for a while has probably heard of faucets. They're website where you can claim small amounts of cryptocurrency for free. Usually the amounts you can claim are barely worth anything, making the time you put into claiming these small amounts of coins not worth it. Over the past few years, I've been using one particular faucet pretty consistently. 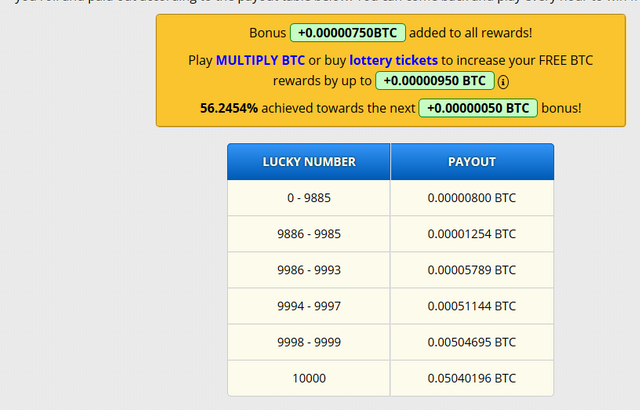 The total amounts of cryptocurrency I've earned through this faucet, exceeds $200 easily. To be completely fair, it's pretty much impossible to earn that much by just claiming the faucet yourself. You need an extensive network of referrals who are pretty active themselves to get these sorts of earnings. I've been pretty lucky with my referrals, since I have a couple of die-hard faucet users among them who seem to claim their earnings around 50 times per day. Most of them are inactive by now, but the ones that remain seem to be in it for the long-haul. 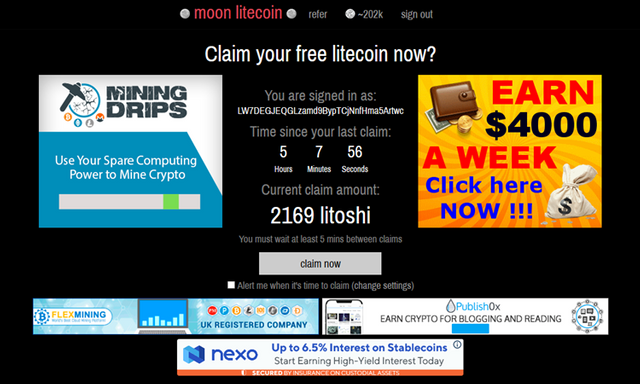 You and your referrals can claim this faucet every 5 minutes and you'll see the amount of Litecoin go up, the longer you wait. You will receive additional earnings, depending on how many active referrals you have and how many consecutive days you've claimed in a row. All these small amounts really add up fast and aside from Litecoin you also receive Coinpot tokens. I can personally transfer a nice amount of Litecoins to my wallet every week or so. 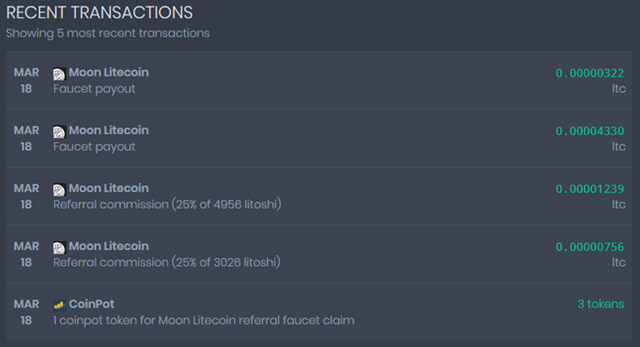 This Litecoin faucet uses Coinpot to gather all your claims and referral earnings. Once you've reached 0.002 LTC in earnings, you can withdraw them to your personal Litecoin wallet. Aside from withdrawing your earnings, you can also choose to enter in the hourly lottery or try your luck with the Coinpot dice game. 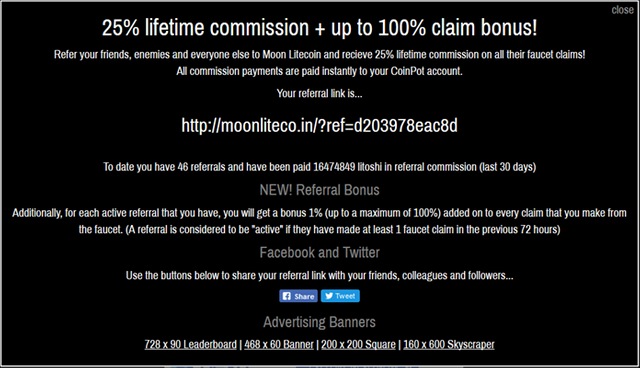 Join Moonlitecoin & Start Earning! If you can find a way to gather enough active referrals for this faucet, it could definitely be worth joining up. Just from claiming it yourself you're really not going to earn anything worth while. Anyone who tells you otherwise is just lying. For me it's been a nice bit of extra income these past couple of years, basically enough to buy me a couple of beers every week and that's just fine for me. I haven't really spent any money gathering more referrals, I've just shared my referral link here and there, as I'm doing now. That is pretty awesome. Unfortunately, I don't have a very big network of people that I could get them to actively participate in something like this. I guess I will just keep plugging along on Steemit :) I am going to resteem this though since you have your referral link on there! I was using the Coinpot faucets but released I could wish more money into my hands... then again I have zero referrals. So yes.. I got a little Doge.. but your right.. the time vs effort isn't worth it. i used to have this one back in the days..and yeah it works like a charm, but the clicking man.....and the ads.....that was just too annoying! This one still works when you have adblock on ;-) But yeah, using it yourself is a bit of a time waster. Your UA account score is currently 4.123 which ranks you at #3302 across all Steem accounts. Your rank has dropped 2 places in the last three days (old rank 3300). In our last Algorithmic Curation Round, consisting of 246 contributions, your post is ranked at #123. Some people are already following you, keep going! Thank you so much for participating in the Partiko Delegation Plan Round 1! We really appreciate your support! As part of the delegation benefits, we just gave you a 3.00% upvote! Together, let’s change the world! You made more than 28000 upvotes. Your next target is to reach 29000 upvotes.